"I dig a lot of the young cats like Louis Hayes--he's so promising and young with so much time ahead of him to do great things in." Louis Hayes led a group at clubs in Detroit before he was 16. He moved to New York in August 1956 to replace Art Taylor in the Horace Silver Quintet and in 1959 joined the Cannonball Adderley Quintet, with which he remained until mid-1965, when he suceeded Ed Thigpen in the Oscar Peterson Trio. He left Peterson in 1967 and formed a series of groups, which he led alone or with others; among his sidement were Freddie Hubbard, Joe Henderson, Kenny Barron, and James Spaulding. He returned to Peterson in 1971. The Louis Hayes Sextet, which he formed in 1972, became in quick succession in 1975 the Louis Hayes-Junior Cook Quintet and the Woody Shaw--Louis Hayes Quintet (Cook remained as a sideman until Rene McLean joined); in its last form the quintet played successful engagements throughout Europe and (without McLean) acted as the host group when in 1976 Dexter Gordon visited the USA for the first time in many years. After Shaw left the group in 1977 Hayes continued to lead it as a hard-bop quintet. 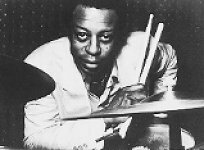 Hayes plays in a compelling, forceful style, marked by a tendency to push the beat and to goad the soloist with frequent fills. A selected discography of Louis Hayes albums. Breath of Life, 1974, Muse. The Real Thing, 1977, Muse.